Liver can be fried either coated in seasoned flour or plain with nothing more than pepper if desired. The key is to have a hot pan with hot grease and to not overcook the liver, as this will make it tough. Drain livers in a colander to remove any excess juices. Heat three to four tablespoons of cooking oil in a heavy skillet over medium high heat until hot. Dredge livers in seasoned flour if desired. Seasonings can range from cracked pepper to exotic steak seasonings. Sear both sides of the liver slices. Turn the heat down to a simmer and cover the skillet. Allow the liver to cook for approximately 10 minutes for each 1/4 inch thickness of the slices. Test for doneness by cutting through one slice at its thickest point. If no pink remains in the meat, the liver is done. A few slices of fatty bacon can be substituted for the oil. Simply fry the bacon crisp and remove before adding the liver to the skillet. The distinctive taste of liver can be toned down a bit by soaking the liver in milk for an hour or more before cooking. The brown bits left in the skillet can be turned into gravy by adding a few tablespoons of flour or cornstarch and water or milk. 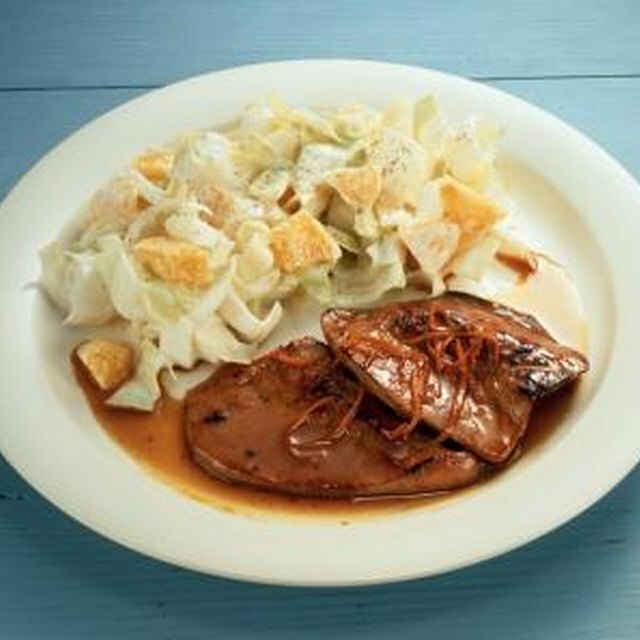 Liver, as with all organ meats, is very rich in vitamins and taste. Liver is especially rich in Iron that is well absorbed and utilized by the body. Liver should always be a bright red-brown out of the package. A green sheen on the surface may indicate that the liver is not fresh. How Long Should Beef Liver Be Cooked? How Many Calories Does a Beef Gyros Have?